Last Monday started like most other Mondays. Ambitions were high and I raced through my things to do list, never looking right or left but straight into the duties before me. I wouldn’t say that I was particularly stressed, just focused. I called the dry cleaners to clear up some confusion on my bill, put a brisket into the crock pot, looked up the recipes I wanted to bring to my daughter’s house for thanksgiving (jotting down the needed ingredients), stripped the beds and threw the sheets into the washer from our weekend guests, made an appointment with my dentist, drove to the bank, post office and grocery, went to two different places to buy Amaryllis bulbs, saving $3.00 a bulb for the extra effort, and raced home to meet the cable guy. I retrieved as many plastic grocery bags as I could possibly hold from the back seat of my car, twisting the handles around both hands before walking up the steps to my porch. There on the mat below the front door, was a present, an act of grace, a small gesture from an unknown someone who caused me to take a detour from the rush and clutter of my morning. 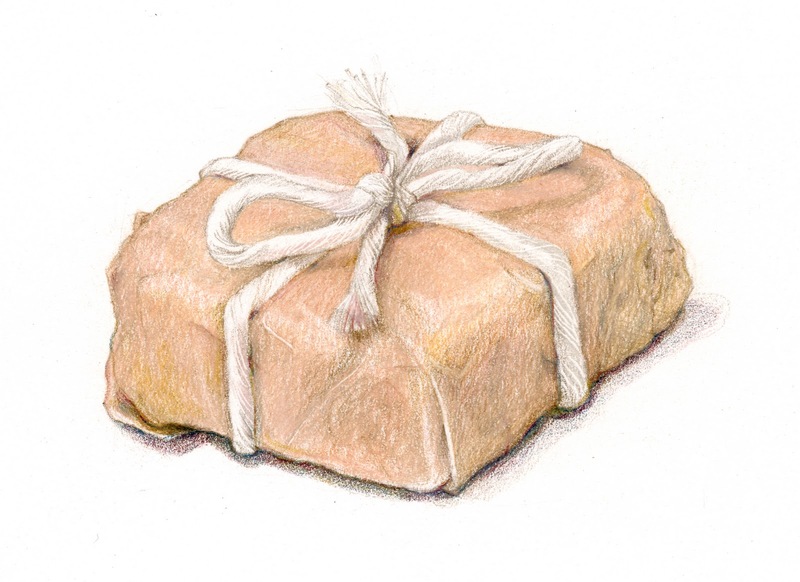 The gift was a rock, a beautiful, honey colored rock with warm marbled markings. It was shaped like a pyramid, smooth, cool to touch and fit perfectly in the palm of my hand. I paused. There is nothing like an anonymous gift. I recalled the time when I discovered one long stem red rose on the steering wheel of my car on Valentines day. I went down all kinds of crazy rabbit trails trying to figure out who the giver was, sifting through quite a number of possibilities. Then I thought of the Secret Santa exchange that we used to do at the office. I was always pretty good guessing who gave what to whom. Most of my secret gifts have come on specific holidays. It’s exponentially better to receive an anonymous gift on an ordinary day. I can testify that flowers sent for no special reason smell sweeter than ones sent for an anniversary (though I love those too, keep them coming). Forgetting the groceries which were still in their bags waiting to be put away and stacked up across my kitchen counter, I walked outside to sit on my porch swing, cradling my new treasure. I contemplated the meaning of the rock and which person in my life could have left it when Amelia walked by. Amelia, the lovely precocious 7-year-old who lives a few doors down on my Mayberry-like Street in Serenbe. So it was Tristin. I know who Tristin is. I see him playing with the other kids on Selborne lane and I know which house he lives in. We exchange friendly good mornings now and then but never much more than that. I think my grandchildren play with him when they come to visit me. I can’t imagine why this charming little boy would give me one of his treasures, but in doing so, he gave me a little bit of his heart. I soon discovered that almost everyone on the block received a similar gift from said mystery person. Was anyone else touched by this unexpected, extravagant, act of kindness? I envision Tristin carefully placing his gifts on each porch while imagining our delightful response. He surely didn’t expect a thank-you, his only joy being the act of giving itself. What is the reason for my procrastination? Is it because I hate the idea of going to the mall or spending unproductive hours searching for on-line bargains, or is it because I have bought into the idea that I can surprise my loved ones with exactly what they never knew they wanted and can find it on sale? I’d really like to do it differently this year, give something that means something. I’m trying to figure out, without putting rocks in all their stockings, how to pass on to each person in my family something of the truth behind every good gift. I want a gift that whispers mystery, like the simple gift of love coming from a child. She looked forward to the fulfillment of a promise. 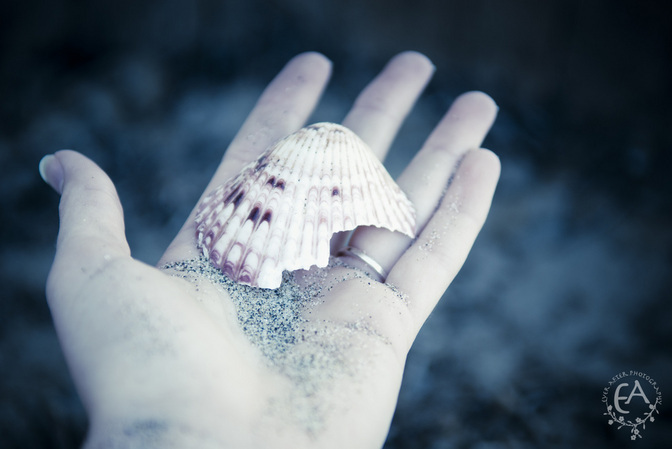 A treasure, ushered in by the morning’s tide, chosen especially for her. She wondered which one would be her own? She pressed her feet into the sand as the morning lazily passed. She felt his presence beside her, he’d been there all along. “What would you have for me today.” she prayed. He gently put his gift into her hand. “But this shell is broken,” she said with concern. “As are we all.” was his reply. “I’d fly,” said the oldest daughter, and her cousin agreed. “I’d be invisible,” said one of the other children. He wanted to sneak up on people and disappear at will. “I’d like to travel back in time,” said the mother, for she had a passion for historical characters. “I’d transport myself into and out of movies,” said the father who obviously enjoyed the cinema. “How about you, grandfather?” asked the mother for he hadn’t answered his own question. And so, the grandson knew that his grandfather already had the greatest superpower of them all.